Imagine what can be made out of just the basic ingredients like flour, butter , eggs and sugar…..cakes, pies, tarts, buns , breads etc etc. Without these ingredients, these delectable desserts would not materialised. I love tarts especially egg and fruit tarts. 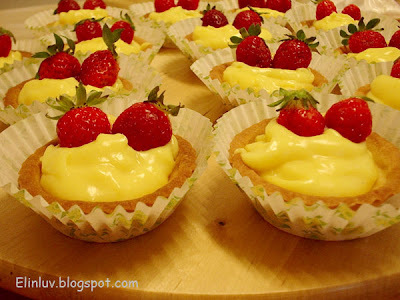 Try this recipe if you love tarts with custard filling and top with your favourite fruits . This tart is best eaten chilled. It is healthy with low fat custard. These tarts are good for afternoon tea treats mmmmm nom nom nom and WB's favourites too. I promised WB that I will make some super nice fruit tarts for him after he finished working on our bathrooms. We have two bathrooms and normally he will help clean up the bathrooms while I clean up my work area , my kitchen counter tops and to organise the fridge space. I do a check on all the ingredients I have...checking their expiry dates, etc. Those expired, I will throw them into the bin and restock whatever has expired. This is our normal weekend chores. He works on the bathrooms and I will work on the kitche :p A very fair deal, isn't it ? I will bake for him while he cleans the bathrooms with cleaning liquids . This cleaning liquids that we bought for the bathrooms has helped scrubbing and cleaning much easier. It has 5 times power action. After the cleaning, the bathroom has a fresh clean smell. And WB will make a check list on all bathroom product so that whatever needs to be replaced, we can shop for them when we go grocery shopping on Sunday after church . To me washing the bathroom is a man's job and he can really do a good job cleaning up the toilets :p I am proud of him and he really deserves all these fruit tarts :) after all the tarts are super healthy...packed with low fat custard...so you tell me ...healthy anot ? :) I allowed him to eat as much as he wants after all he did a great job on the two bathrooms ! Beat butter and icing sugar till well mixed. Add in egg white and yolk till incorporated into the butter mixture. till it becomes a dough. Rest the dough for 10 mins . Divide dough into 35 gm balls. Press dough into smart tart moulds. rack . Store in air tight container. Mix the custard powder in ½ cup of milk and keep aside. Heat the remaining milk with the sugar and mix well. Add the custard powder mixture and vanilla essence and cook over a low flame, stirring continuously till the mixture coats the back of the spoon. Cool and divide the custard into 8 equal portions. Keep aside. 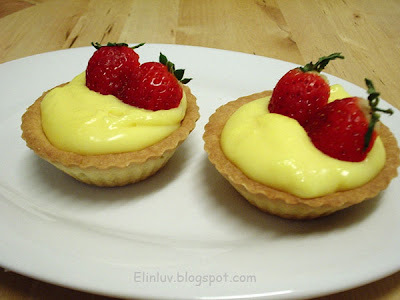 Fill each tart with a portion of the custard and refrigerate until the custard is set. 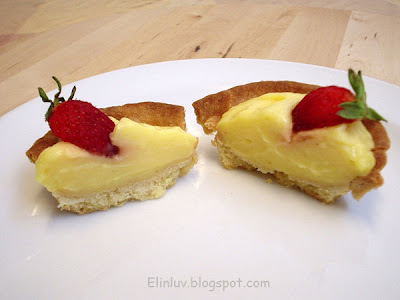 Just before serving, top each tart with mixed fruits and serve immediately. hi Elin, how long to bake the tart shells? hi Elin, how long should I bake the tart shells? Wedding Plans...So Much To Do !